Have you ever tried soaps to deal with your ugly acne? Well, we are serious! You can get rid of those pesky breakouts with the help of the good, old soap and it actually works! However, the soaps intended for acne and pimples are different from regular soaps as they mostly comprise ingredients that are capable of combating acne-causing bacteria. So, if you are yet to give acne soaps a try, here is your chance to pick one for yourself. Read on to know more. The key to finding the right acne soap is figuring out the root cause of your acne. While the topical application of the soap works as a temporary solution for acne, knowing and targeting the root cause first will help you make the most of it. So, change poor food habits, embrace a healthy lifestyle, exercise regularly, and follow the proper skincare routine in order to combat all acne-causing factors internally. This will, indeed, help you pick the most effective soap and get the most out of it. Know your skin type before you make a purchase. This is highly important as applying a wrong product to an acne-prone skin can cause adverse effects in no time! As a result, you may end up making your acne even worse. Hence, make sure that you evaluate your skin first prior to evaluating the right soap for yourself. Now, take time to research thoroughly and find the best soap based on the nature as well as the requirements of your skin. The Dermadew Acne Soap by Hedge & Hedge is a gentle oil-based cleanser that works wonderfully for oily, acne-prone skin. It contains both natural and synthetic anti-acne actives along with certain emollients, moisturizers, and nourishers. Some of the major ingredients of the Dermadew Acne Soap are salicylic acid, tea tree oil, aloe vera extract, olive extract, willow extract, glycerin, and manuka concentrate. It also has a beautiful yet mild aroma. When used in accompany with anti-acne medications, the soap dries out existing acne fast and fades out their marks over time. It also prevents the occurrence of new acne by creating a rich lather and cleansing away the skin effectively. 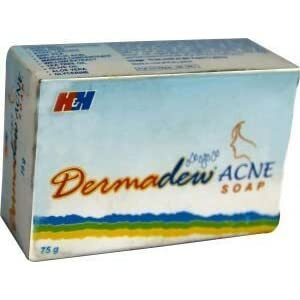 However, the Dermadew Acne Soap does not over-dry the skin during the process. Rather, it is extremely gentle on the skin and leaves it clean, soft, and supple. Price: Rs. 164 for 75 g.
The Acnil Pimple Care Soap contains sulfur and salicylic acid – two primary ingredients that help in rooting out acne. It is basically an antiseptic soap that has a natural floral fragrance. It helps open up closed pores, fights against acne-causing bacteria and does not cause excessive dryness. The soap develops a rich lather. Use it to wash your face twice a day. You could do it thrice if your face is very oily. Price: Rs. 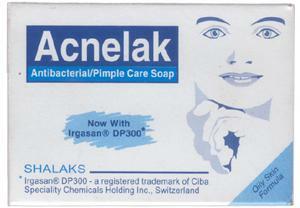 150 for 75 g.
Acnelak soap contains 0.5% triclosan which helps in weeding out acne-causing bacteria. The soap also contains zinc oxide which helps in soothing inflammation and healing your skin quickly. It has special oil-dissolving ingredients that rid the skin of excess sebum. It can be used to wash the face 2-3 times in a day. Price: Rs. 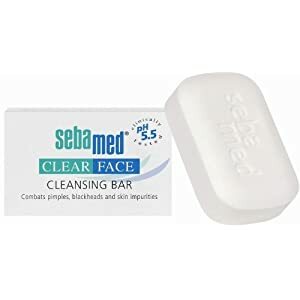 75 for 75 g.
The SebaMed Clear Face Cleansing Bar is a soap-free cleansing bar that is ideal for acne prone and blemished skin. It effectively reduces acne, pimples, and blackheads by maintaining the skin pH at 5.5 and killing acne-causing bacteria. It is enriched with Vitamin E that zap out the free radicals from your skin. The soap has natural moisturizers in the form of lecithin, vitamins and amino acids which help in keeping your skin soft and supple. Price: Rs. 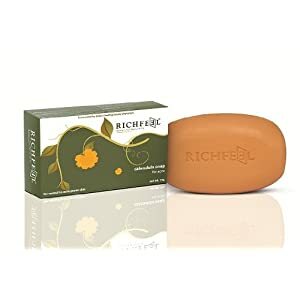 180 for 100 g.
The Richfeel Calendula Soap is a time-tested and potent antiseptic formula that gives us an acne-free, radiant skin easily. It contains calendula extracts, which helps fight acne-causing bacteria and enhances the skin complexion simultaneously. The anti-inflammatory properties of calendula also soothe inflammation, irritation, skin burns, and swelling. This gentle soap is non-dehydrating and keeps the skin moist even in winters. It also assists in removing suntans, blemishes, and acne scars from the skin successfully, thereby leading to a healthy and even-toned skin. Wash your face with this soap twice a day for the best results. Price: Rs. 89 for 75 g.
A good acne soap should be capable of eliminating dirt and excess oil from your skin efficiently, thereby keeping it squeaky clean. Make sure that your preferred soap is strong enough to do that. Skip foaming soaps that form rich lathers and big bubbles as they can actually damage your skin, especially if it is dry or sensitive. Such products cleanse the skin superficially and stick to it, which dries the skin out and tightens it up. Pick a soap that cleanses the skin easily and perfectly by making small bubbles and creamy lather. It will give you a clean and fresh look. Your acne-fighting soap must be non-abrasive and completely free of alcohol. Otherwise, your skin will become extremely dry and irritated after each use, which is not good for an acne-prone skin. Whether you have a dry skin or not, your acne soap should come with emollients. Check the ingredient list of your chosen product to find names, such as glycerin, petrolatum, mineral oils, lanolin, etc., so that your skin does not lose its natural moisture while getting rid of acne. A soap containing exfoliators, such as alpha hydroxy acids is also good for smoothening rough, patchy areas of the skin during the process. 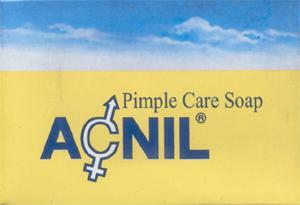 Using an acne soap under medical supervision is always the best as it allows you to use medicated products. Most of the medicated acne-fighting soaps contain special ingredients (salicylic acid, benzoyl peroxide, sodium sulfacetamide, etc. ), which take the good care of the skin while combating acne.